An average beekeeper normally produces a few hundred kilos of honey in a season, (though in the past season we produced about half the normal amount), and as a by-product, less than 30 kilos of wax. Beekeepers try to save bits and pieces of wax while working around the hives and particularly when harvesting honey — by the end of a season this increases to an impressive and valuable accumulation. Beeswax is the material that honey bees produce to make comb for storing honey and pollen and for rearing their brood. This Guild is still in existence and I have been to many interesting conferences in its building in Gresham Street, in central London. Where does beeswax come from these days? The answer is all over the world. Five centuries ago it would probably have come from France or Germany from where, incidentally, we still buy superb clean wax and from Russia via Hamburg and the Hanseatic league. Beeswax is produced by worker honey bees (the females) in the beehive who secrete beeswax from six special glands on the underside of their bodies. As the bees get older they lose this ability but while young, they have to consume large amounts of honey and pollen to produce wax — around 13kg of honey to make 1kg of wax. The wax is secreted in the form of small scales (of the size of a pinhead) and about 1,100 scales are required to make a gram of wax. The scales are subsequently moulded by the worker bee using her mouthparts into a comb. These scales are initially clear, tasteless, odourless and colourless and become opaque and darker — more yellow or brown — from contamination with pollen and propolis. The hexagonal honeycomb cells produced are an amazing wonder of architecture. It forms an extremely strong and robust structure which provides maximum cell space with the minimum amount wax. The beeswax secreted by the worker bees has a specific mixture of the fragrance of honey, propolis and pollen and reflects the nectar used, just like honey. The best wax comes from the cappings the beekeeper scrapes from the combs, before spinning the honey out of them. Generally beeswax needs to be cleaned before use. Since it has a low density and floats on water, while the impurities are heavier, it is usually melted and cleaned in a water bath, which allows the impurities to be separated. However, the desired aroma and charm of beeswax, as well as many of its unique health advantages come actually from the natural “contaminants” — honey, propolis and pollen. There are few beekeepers who are not fascinated by beeswax, and thankful that their craft has this aspect. Blocks of bright, clean, nicely moulded wax are quite easy to produce. There are dozens of uses in various crafts, but the one that is of widest interest is of course candle making. 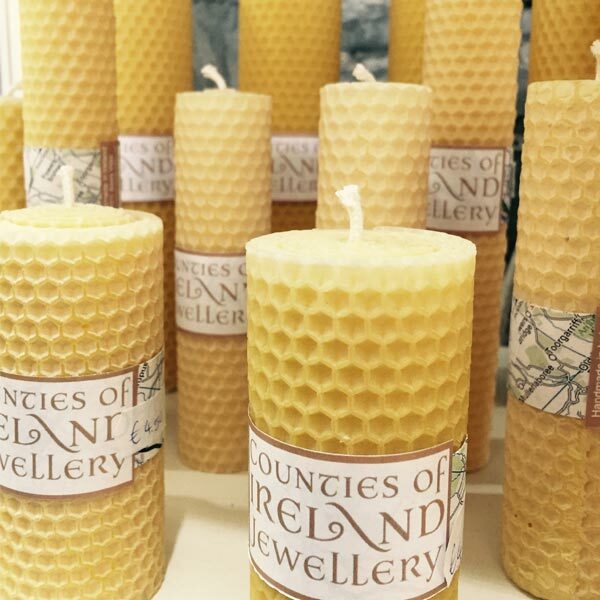 Beeswax candles are beautiful, practical and fragrant.